Rachel VanSickle-Ward (B.A. Pitzer College; M.A. and Ph.D. University of California, Berkeley) is a professor of Political Studies at Pitzer College in Claremont, California. 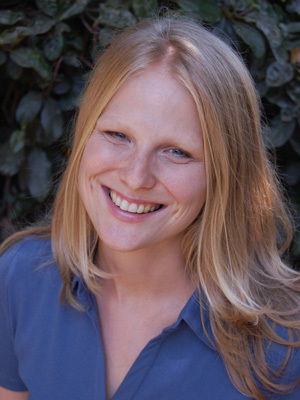 Her research interests include public policy, public law, and gender and politics. She has published work on the politics of statutory language, gender and political ambition, and administrative law. Her first book, The Devil is in the Details: Understanding the Causes of Policy Specificity and Ambiguity (SUNY Press, 2014), explores the impact of political and institutional fragmentation on policy wording, focusing on the dynamics of social policy construction in the states. She is a frequent commentator on KPCC’s Take Two (Southern California Public Radio). Her writing has appeared in Talking Points Memo, The Washington Post (The Monkey Cage), and U.S News and World Report. She was named the 2012 Pitzer College Scholar in Residence for her research on contraception politics and policy, and it currently working on a book on the subject. The Politics of the Pill: Gender, Framing and Policymaking in the Battle over Birth Control (with Kevin Wallsten). Oxford University Press (under contract). The Devil is in the Details: Understanding the Causes of Policy Specificity and Ambiguity. SUNY Press. January 2014. Paperback released in 2015. (Winner of the 2018 Herbert A. Simon Book Award). al.). PS: Political Science & Politics (May 2018): 1-7. “Making it Personal: Assessing the Impact of In-Class Exercises on Closing the Gender Gap in Political Ambition,” (with Jill Greenlee and Mirya Holman) Journal of Political Science Education. Journal of Political Science Education, vol. 10, no. 1 (January 2014). “An [Un]clear Conscience Clause: The Causes and Consequences of Statutory Ambiguity in State Contraceptive Mandates,” (with Amanda Hollis-Brusky) Journal of Health Politics, Policy and Law 38 (August 2013): 683-708. “The Politics of Precision: Specificity in State Mental Health Policy,” State and Local Government Review 42 (April 2010): 3-21. “Hawks and Doves? : An Analysis of Latina and Latino attitudes toward military intervention in Iraq” (with Adrian Pantoja) in Distinct Identities: Minority Women in U.S. Politics. Routledge 2016.
and Bruce E. Cain and The New Political Geography of California, eds. Fredrick Douzet, Thad Kousser and Kenneth P. Miller, Perspectives on Politics 8 (March 2010): 355-357. 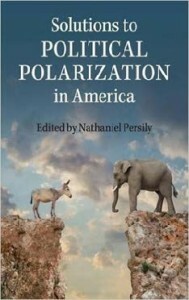 “The 2003 Recall Debates: Issues, Candidates, and Media Coverage” (with Darshan Goux), in Governing California: Politics, Government and Public Policy in the Golden State, ed. Gerald C. Lubenow, Berkeley: Berkeley Public Policy Press 2006. “Marshall v. Barlow’s Incorporated: Legitimizing Regulatory Enforcement” (with Robert Kagan), in Administrative Law Stories, ed. Peter Strauss, New York: Foundation Press 2005. “The ‘Economic Woman’: Why Hillary Clinton’s economic message still matters” (with Emma Stephens), US News and World Report, April 12, 2017. “Latina Voters Say Adiós To Trump” (with Adrian Pantoja), Huffington Post – Latino Decisions, October 4 2017. “A Mother for President: How Democrats are changing the way motherhood is linked to presidential power” (with Jill Greenlee), US News and World Report, Aug 5, 2016. “Here are two ways that Breyer’s Wonky opinion in Whole Women’s Health could transform abortion politics” (with Amanda Hollis-Brusky), The Washington Post (Monkey Cage) July 3, 2016. “Clinton Does Inspire: The Narrative About Hillary Clinton’s ‘Enthusiasm Gap’ Silences the Political Voices of Women” (with Jenn Merolla), US News and World Report, June 2, 2016.
and ‘unqualified’” (with Jill Greenlee and Mirya Holman), The Washington Post (Monkey Cage), April 10, 2016. Write Ambiguous Laws?” The Washington Post (Monkey Cage), March 6, 2015. Talking Points Memo, July 3, 2014. Keynote, Arsalyn Youth Conference, “Stop Running from Office,” in Los Angeles (University of Southern California), February 18, 2017. “Gender and Media Coverage in the 2016 Election,” Women’s Political Action Panel, Women’s Resource Center in Riverside (University of California, Riverside), January 20, 2017. “Gender and the 2016 Election,” Mount San Antonio Gardens in Claremont, CA, December 7, 2017. “Religion, Women and Health: Gender and Issue Framing in Hobby Lobby,” Annual Meeting of the Southern California Law and Social Science Forum in San Diego (University of California, San Diego), March 2016. “Contraceptive Coverage Policy in the States,” presented at the State Politics and Policy Conference in Sacramento, May 2015. “The Politics of the Pill: Gender and Policy Framing in Debates over Contraception Coverage,” presented at the Annual Meeting of the Midwest Political Science Association in Chicago, April 2015. “Mandates and Minefields: Regulating Contraceptive Coverage,” presented at the Annual Meeting of the Southern California Law and Social Science Forum in Los Angeles (University of Southern California), March 2015. “Covering Contraception: The Impact of Gender on Media Coverage of the Contraception Mandate” (with Kevin Wallsten and Shiyana Gunasekara) presented at the Annual Meeting of the American Political Science Association in Washington, D.C., August 2014. “Wrestling with Conscience: Construction and Litigation of Conscience Clauses in Contraception Insurance Law,” (with Amanda Hollis-Brusky) presented at Southwestern Law School, April 2013. “The Battle Over Birth Control: Gendered Dimensions of the Contraception Policy Debate” (with Kevin Wallsten and Shiyana Gunasekara) presented at the Annual Meeting of Western Political Science Association in Hollywood, March 2013. 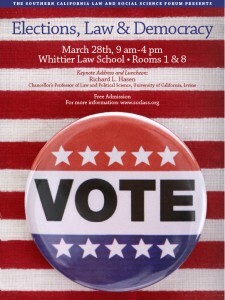 Panelist, “Election Year Politics and Economics,” Inland Empire Forecast Conference hosted by the Inland Empire Center at Claremont McKenna College and the UCLA Anderson School of Management. Ontario, CA, October 2012. An [Un]clear Conscience Clause: The Causes and Consequences of Statutory Ambiguity in State Contraceptive Mandates,” (with Amanda Hollis-Brusky) presented at the International Conference on Law and Society Honolulu, June 2012. “Making it Personal: Female Students and Running for Political Office,” (with Jill Greenlee) presented at the Southern Political Science Association Annual Meeting in New Orleans, January 2012. “Are Latinas More ‘Dovish’ Than Latinos? Evidence from the 2006 Latino National Survey,” (with Adrian Pantoja) presented at the Annual Meeting of the Midwest Political Science Association in Chicago, March 2011, and the Annual Meeting of Western Political Science Association in San Antonio, April 2011. “An Unclear Conscience Clause: Contraception Access in the States,” presented at the Annual Meeting of the American Political Science Association in Washington D.C., September 2010. “Framing Clinton: Gender and Media Coverage of the 2008 Primary Debates,” (with Darshan Goux) presented at the Annual Meeting of the American Political Science Association in Toronto, September 2009. “The Fuzzy Front End and the Policy Primordial Soup: Linking Policy Cycles to New Product Development Cycles,” (with Preeta M. Banerjee) presented at the Annual Meeting of the American Political Science Association in Toronto, September 2009. “Prophecy, Performance and Pronouncement: Media Coverage of the 2008 Primary Debates,” (with Darshan Goux) presented at the Annual Meeting of the American Political Science Association in Boston, August 2008. “Agreeing to Disagree: Party Conflict and Policy Specificity in California,” presented at the Annual Meeting of the Western Political Science Association in San Diego, March 2008 and the Annual Meeting of the State Politics and Policy conference in Philadelphia, May 2008. “Explicit Language: Fragmentation and Policy Specificity in Mental Health Parity,” presented at the Annual Meeting of the Midwest Political Science Association in Chicago, April 2006. “Self-fulfilling Prophecy? Media Coverage of California’s 2003 Gubernatorial Debates” (with Darshan Goux), presented at the Annual Meeting of the Western Political Science Association in Oakland, March 2005. The Southern California Law and Social Science Forum brings together Southern California-based scholars from a range of academic disciplines to share their work in the areas of American, International, and Comparative Law. To date, its events have attracted hundreds of scholars, students, and community members from across Southern California. 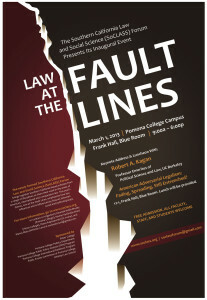 The Forum held its innaugural event on March 1, 2013 at Pomona College in Claremont, CA. That year’s theme, Law at the Fault Lines, emphasized the ways in which law influences and is influenced by fissures between social and political groups. There were three panel sessions (“Marginalization & Law,” “Gender & Law,” and “Transitional Justice in Comparative Perspective”) as well as a Keynote Luncheon Address delivered by last year’s recipient of the APSA Law & Court’s Lifetime Achievement Award, Robert A. Kagan (Harvard & UC Berkeley Political Science). The Forum held its Second Annual event on March 28, 2014 at Whittier Law School. The theme, Elections, Law, and Democracy, brought together scholars doing work at the intersection of voting rights, election law, electoral reform, and campaign finance. The Keynote Luncheon Address was delivered by scholar and renowned election law expert, Richard Hasen (UC Irvine School of Law). The Forum held its Third Annual event on March 27, 2015 at University of Southern California. Co-sponsored by the USC Law School and Political Science Department, SoCLASS III examined the theme of Law, Regulation, and Social Science. The conference featured eight panels of distinguished scholars from Southern California and beyond plus a keynote address by distinguished University of Pennsylvania scholar and regulation expert Cary Coglianese. Program and other details can be found here. The Forum held its Fourth Annual event on March 18, 2016 at University of California, San Diego. Co-Sponsored by UCSD’s Center for Tomorrow’s California and The Yankelovich Center for Social Science Research, SoCLASS IV examined the question Are We Entering an Era of Dysfunction in American Government? If So, Can It Be Stopped? The Conference featured presentations by eighteen scholars and a Keynote Address by Nate Persily (Stanford University Law and Political Science). Full program available here. SoCLASS held its Fifth Annual event on April 28, 2017 at Claremont McKenna College. Co-sponsored by the David Dreier Roundtable, SoCLASS V explored the timely theme of Law and Legitimacy. The Conference featured work by seventeen scholars on a variety of topics and a keynote address by CA Senate President Pro Tem Kevin de Leon. Full program available here. For more information about SoCLASS go to https://www.facebook.com/SOCLASSforum or contact SoCLASS Steering Committee members Amanda Hollis-Brusky (Pomona College), Rachel VanSickle-Ward (Pitzer College), Christian Grose (USC) and Thad Kousser (UCSD).